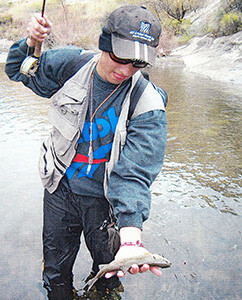 In 2004, I had the opportunity to go on an amazing fishing adventure, fly fishing for wild trout! 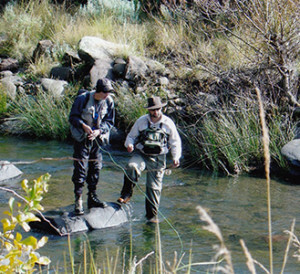 It had been my fly fishing dream up until this point and it is all I think about now, I am so keen to fly fish for those wild Rainbows and Browns once more. And I promise you I will be back soon and, hopefully, more than once. We stayed at a place called the Walkerbouts Inn (At the time owned and run by Dave Walker) in the Rhodes area, it was a lovely place, but the fishing was what we were here for. It was a long time ago but I will never forget some of the fish I caught, techniques I learnt, and the beauty and tranquility of fishing a piece of shallow, crystal clear wild river: wading to the holes, site fishing at rising Trout, it was magical… Roll casting, drifting nymphs over holes and casting dry flies up stream, what an amazing experience. It was a while back but I remember hooking into an Egyptian Goose, it actually flew towards my dry fly and as it landed tried to eat it. It was safely released with no injury, strangely enough the guide I was fishing with said that at this specific spot this had happened to him numerous times previously. But anyway, onto the story. 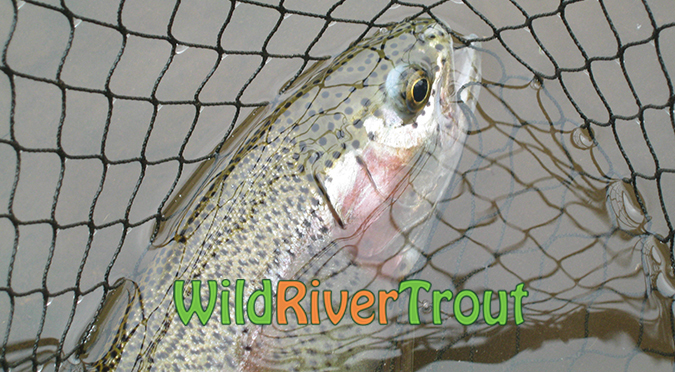 We had 2 and a half days of superb, but tough, river fishing. 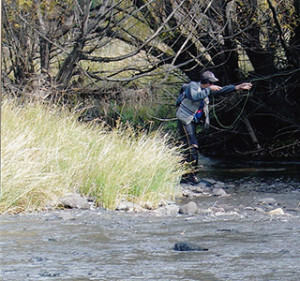 We fished 3 sections of the famous Bell River, one close to a bridge somewhere on the main road, one at Monard and one at Parksgate. I luckily kept a journal at the time, so can re-live this amazing trip through fairly accurate memories. So after the first brief session my father and I did close to the road we checked in at the Walkerbouts Inn, and spoke to some of the people there about the fishing. I was so excited I could hardly sleep. I was up early the next morning, but my father had long since passed the days of “early rising”. It was the 30th of April 2004 and we drove onto the Monard farm and fished the beat of the Bell from 10am until 430pm. 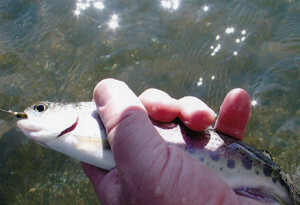 My father caught many fish on different methods, I managed just 2, both on an Adams size 16. The scenery was magical as the area we went through was part of the Glass Nevin Nature Reserve. The water was cold, and very clear, so the fish were spooked quite easily. My father caught Rainbows on dry fly and nymph, we were both using 4 weight rods. The fish were all in the 20-25cm range and were absolutely beautiful. I missed 5 fish, 4 on the trusty G.R.H.E. and 1 on the Adams, it was a stunning day.